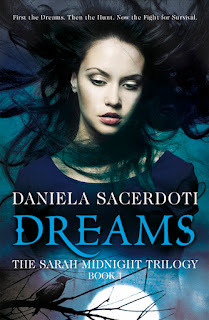 Dreams (Sarah Midnight, #1) by Daniela Sacerdoti. Publication : April 18th 2012 by Black and White Publishing. "You’d never think it could happen to you. You’d never think that one day you’ll stand in a graveyard, rain tapping on a sea of black umbrellas, watching your parents being lowered into the earth, never to come back. It’s happening to me. They said it was an accident. Only I know the truth. My parents were hunters, like their parents and grandparents before them, hundreds of years back, scores of ancestors behind me, fulfilling the same call. I must follow in their footsteps. I am the only one left to keep the promise. I can never give up the fight, this fight that has been handed down to me, thrust upon my unwilling shoulders. I’d rather be buried with my parents, my brave, fierce father and mother, who lived and died by the Midnight motto: Don’t Let Them Roam." There will be two winners and each get a copy of the book. It's the author/publisher's responsibility to ensure the winner gets the book, I'm in no way responsible. wow, i love the cover and the story sounds wicked interesting!! Thank you for the giveaway!! I am in love with the cover - the model is beauuuutiful and I love the ethereal feel of it. It's perfect considering the book's content and title!